For the most successful service providers, employee education is a career-long process. 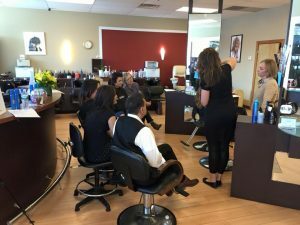 The best salons develop systems to strengthen the skills and confidence of their newest team members while encouraging their seasoned staff to continually stretch by bringing education into the salon and by supporting those who venture out to seek new skills. Chameleon Haircolor Cafe believes that education is critical to our success and we make significant investments in our team. We start with a new talent training program which all employees progress through. Our education continues for our entire team with advanced in salon education. We bring in platform stylists from Oribe, Bumble and Goldwell. Chameleon sends our team members to advanced education, in NYC, at the national academies of Goldwell, Oribe and Bumble. Our team trains with the best educators in our industry. What Chameleon does different then most salons … is that we pay for all education, including our team members salary. Most salons leave education up to the stylist to pay for, but not Chameleon. Chameleon has also been honored for our Benefits and Compensation program. Our team members take care of the clients and Chameleon takes care of our team. Chameleon offers a rewarding compensation and benefits package that is designed for amazing career paths, not just a jobs. 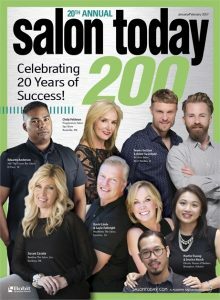 Salon Today has recognized Chameleon as a Top Salon for our Benefits and Compensation program. ~ Carleen Buden Chameleon Owner. 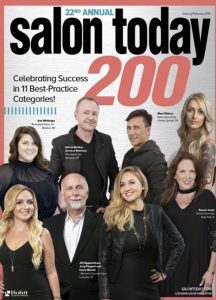 Chameleon accepts two awards as a Top 200 Salon in the United States by the Salon Today! 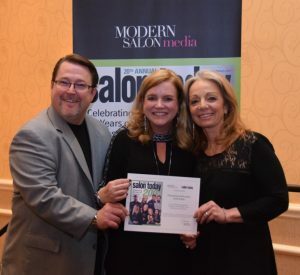 Thousands of salons are evaluated and it is a great honor to win these awards. This is the Third year we haven been honored. A special thanks to the incredibly dedicated and talented Chameleon Team! We really appreciate everyone’s great work at Chameleon and the great clients who trust us with their hair! Thank you and you make it happen everyday at Chameleon!